Our Easiest Weeding and Masking Print and Cut Material! 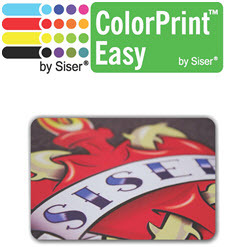 ColorPrint Easy is hands down the easiest weeding print and cut material ever! Simply print and cut your design, weed the excess with ease, and mask with very little effort. Peeling the carrier is a snap too. ColorPrint™ Easy applies at only 300° F, which gives you the ability to apply to special materials that require a lower application temperature. Logos will have a semi-gloss finish.